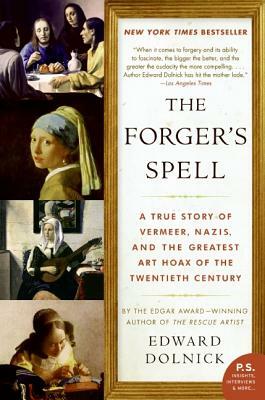 As riveting as a World War II thriller, The Forger's Spell is the true story of three men and an extraordinary deception: the revered artist Johannes Vermeer; the small-time Dutch painter who dared to impersonate him years later; and the con man's mark, Hermann Goering, the fanatical art collector and one of Nazi Germany's most reviled leaders. Edward Dolnick is the author of Down the Great Unknown, The Forger’s Spell, and the Edgar Award-winning The Rescue Artist. A former chief science writer at the Boston Globe, he lives with his wife near Washington, D.C.
Who can resist the story of a great scam--especially when the mark is art-greedy Hermann Goering and the author is an Edgar winner? Vividly portrays a staggeringly successful Dutch art forger. . . . Dolnick covers it all. . . . Dolnick’s zesty, incisive, and entertaining inquiry illuminates the hidden dimensions and explicates the far-reaching implications of this fascinating and provocative collision of art and ambition, deception and war. Mesmerizing account. . . . Dolnick brings his expertise in art theft, criminal psychology and military history to a scintillating portrait. . . . Polished, fast-paced narrative. . . . Compelling prose. . . . Energetic and authoritative.